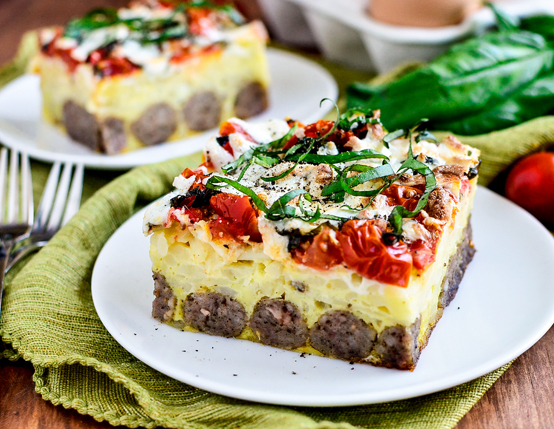 The fresh, bright flavors of tomato and fresh basil complement the sausage and hash browns in this breakfast casserole recipe. Preheat oven to 375°F. Spray 8x8 glass baking dish with nonstick spray. Whisk eggs, salt, and pepper in bowl; set aside. Arrange frozen sausage links in an even layer in bottom of baking dish. Spread hash browns evenly on top. Sprinkle with half shredded cheese followed by tomatoes and basil. Pour in eggs; gently shake baking dish to ensure eggs are evenly distributed. Sprinkle remaining cheese on top. Cover with foil that's been sprayed with nonstick spray and bake for 40 minutes. Remove foil and continue baking for 5-10 minutes or until cheese is golden brown. Let sit for 15 minutes before slicing and serving.